When you first start out playing electric guitar, it goes without saying that it all begins with a guitar and an amplifier. Those are the two most basic parts of your setup, and they’re all you need for learning the fundamentals. Once you have a grasp of your foundation, though, you’re probably wondering how professional guitarists manage to get so many different sounds out of their instruments. Effects pedals are the answer to that question. In this buying guide, you’ll learn the essentials of what effects pedals do and which ones to look for depending on the kind of tone you want to experiment with. Here’s the quick overview: effects pedals (also called “stompboxes”) are electronic devices that connect in-line with your guitar and amp to change the signal going through them. Some work with analog circuits and some are digital, but they’re all powerful tools for shaping your sound in endlessly creative ways. Get the chorus pedal that fuels the deep, dark guitar sounds of Black Label Society frontman Zakk Wylde. Learn More. It can be tough to know where to start when you’re looking at as many options as there are in the world of effects pedals. In fact, your first pedal may not even be a pedal at all – many amplifiers have built-in effects sections so you can get your introduction without having to attach an external stompbox. But if you have a more straightforward amp, or if you’re ready to try effects units that go beyond its built-in capabilities, there are some great varieties for novice users. And don’t forget that you can always look up the preferred pedals of your favorite guitar hero to inspire your own collection. In this category, we’ll cover the simplest, most affordable types of effects. They’re also some of the most widely-used, so it’s a given that you’ve already heard them in action. For your very first pedals, these are the kinds to look out for. These multi-effects pedals are exactly what the name suggests: all-in-one models that pack multiple effects into a single box. There are a few benefits to this, one of which is value, since getting more than one effect at once gives you great bang for your buck. They also tend to come with presets that give you customized mixes of their various effects, which can do a lot to teach you how different effects interact and how to mix and match them yourself. Packed with powerful Boss features to make you sound like a pro, yet it’s as fun and easy to use as a stompbox. Learn More. Think of Stevie Ray Vaughan, and you’ll have a good idea of what overdrive effects can do. They’re based on the ‘broken’ sound that vintage tube amplifiers would make when they were fed a signal too strong for them to handle smoothly. Modern overdrive pedals can also have circuitry that emulates the same effect even when connected to a solid-state amp. Because they work by boosting the signal, experimenting with the effects of an overdrive pedal can be as simple as adjusting the volume and seeing what happens. Tone, drive, and level controls give you access to warm, amp-like overdrive that’s touch sensitive and ready to rip. Learn More. The Archer is a versatile overdrive/boost with amazing headroom that is designed to help you cut through the mix. This dude is loud! Learn More. Distortion pedals is responsible for many of the sounds that you think of when you think ‘electric guitar.’ It’s absolutely classic, and you’ll find that the majority of effects are some flavor of distortion pedal. The results you can get from these stompboxes vary from overdrive-like breakup to smooth melodic power, so it’s important before you take one home that you check for the type of sounds that specific distortion pedal is designed to create. Doing your homework really pays off when it comes to distortion pedals. The DS-1 provides a harder distortion effect for guitars. All the grind you’ll ever want. Learn More. You can think of these as distortion pedals turned up to 11. Usually, a fuzz pedal comes in as an accent for solos and intros, since its effect is so strong that it could overpower the rest of the band otherwise. You can hear an example of fuzz in the classic recording of Jimi Hendrix playing The Star-Spangled Banner at Woodstock. This is a good type of pedal to try out as an introduction to more powerful effects. Now, you can get the same Fuzz Face tone Jimi used to woo the masses at some of his most famous performances. It comes in a pedalboard-friendly Fuzz Face Mini housing, complete with an AC power jack and an on/off status LED. Learn More. The following effects are a step up from your basic overdrive, distortion and fuzz, with more specialized sounds. In this category, you’ll find pedals that include effects such as time delays or frequency modifications – things that go beyond changing the shape of a sound by also changing the pitch, rhythm or both. Others are simpler, but still offer enough tone-altering potential to set them apart from the basic pedals. Parametric and Graphic EQs – These are the most straightforward variety, giving you blanket control over the power of individual frequency ranges. They’re important when playing in a band, since they let you tweak your sound for better blending with the other instruments. The Boss GE-7 lets you silently switch 7 bands of +/- 15dB fine EQ control in and out of your guitar signal. Learn More. Wah – This type of pedal was a Jimi Hendrix favorite, and you’ve probably heard the original “Cry Baby” in a lot of music. It was the first wah pedal to find success, and paved the way for others to follow. 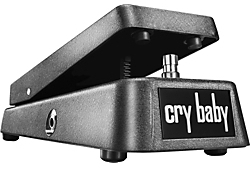 The Cry Baby is an example of manual wah, controlled by a rocker pedal that adjusts the level of treble response dynamically as you move it. Some modern wah pedals, by contrast, are “auto-wah effects,” which do the same thing but use presets for control instead of live input from your foot. This is the original—the one that created some of the most timeless sounds in rock. A true rock classic every guitar player should have. Learn More. Harmonizers – Commonly used for vocal harmonies, these pedals can do a lot to beef up your sound. You can also use them in creative ways, like Steve Vai and Robert Fripp, who have been known to disable the main signal altogether so that their music is coming only from the pitch-shifted output. Using a modern harmonizer can be as easy as setting it to the key you’re playing in, and many even support more than one harmony at once. Gives you 10 signature effects for maximum tonal tweaking. Learn More. Octave Generators – With the ability to create a ton of depth, an octave generator is a great choice for your first pitch-shift effect. Think of it as a harmonizer with a fixed preset of one octave, usually below the fundamental. Everything from the surreal jangle of an 18-string guitar, to rich, thick walls of symphonic sound. Learn More. The Whammy – If you’re familiar with the tremolo arm, or “Whammy bar,” then you already have an idea of what this pedal can do. Usually, the Whammy pedal is a rocker type, much like the wah, which shifts the pitch up and down as you rock it back and forth. Eddie Van Halen, Jimi Hendrix and Joe Satriani are a few of the artists you can listen to for a general feel of this pedal’s potential. Tremolo – Not to be confused with a tremolo bar (which is closer to the Whammy pedal), this effect works on volume. You can think of tremolo pedals as being like strumming a note, and then wiggling the volume knob on the amp while it’s ringing. Usually, the pedal will have controls for speed (equivalent to how fast the volume is “wiggled”) and depth (equivalent to how far the knob would be turned). Phasers – Sometimes called “phase shifters,” these pedals take the “copy” of the guitar signal and put the waves out of phase with each other before mixing them back together. Since those sound waves are no longer in sync, they’ll interact in unique ways, creating futuristic whooshing and swooping sounds. Look back to late 1970s and early ’80s rock music, and you’ll see lots of examples of phasers in action. A musical and vintage sounding phaser designed specially for guitar. Learn More. Flanger – Before digital recording was the standard, a common trick used by artists was to touch one of a tape recorder’s reels to slow it down, then let it go so it would catch up with the main track. The result was a sound that could be subtly thicker or downright unrecognizable, and it’s the effect that flangers are designed to reproduce. You can hear Jimmy Page’s use of a flanger on Nobody’s Fault But Mine and Kashmir, by Led Zeppelin. Get those Jimi sounds with the Electro-Harmonix flanger / chorus pedal! Learn more. Chorus – This is the subtlest type of modulation effect. It does exactly what its name suggests, making it sound as though multiple instruments are all playing in unison. The effect could be compared to running a signal through two amps at once and setting one on a slight delay; in fact, that’s how many artists created chorus effects before these pedals were commonplace. Will make your sound go round with two distinct chorus settings from TC Electronics. Learn More. Delay – Like flangers, these pedals go back to the days of tape recording. They work by copying the guitar signal and playing back the copy a short time after the original. You can usually set a delay pedal to repeat the sound multiple times for an echo effect, or just once for a rockabilly slap-back on every note. Analog pedal with time-tested tone and flexible settings in an amazingly compact package. Learn More. Reverb – The best analogy for reverb effects would be playing your guitar inside a pipe. That’s an extreme level of reverb, of course, and these pedals will allow you to go from there all the way back to subtler effects like the natural reverberation of a concert hall. This effect sounds great with a clean tone, but beware of using it with heavy distortion or else you might lose too much definition from your sound. An amazing collection of reverbs along with delays, pitch shifting, and other effects. Learn More. Echo – There is some crossover between delay pedals and echo pedals, but as a general rule, you can think of echo effects as extended delay effects. It’s a brother of reverb pedals, producing the canyon-like echoing you would naturally hear in a wide-open space. With long enough settings, an echo pedal can even let you harmonize against your own notes as they repeat. The Alien Echo is Rockett Pedals’ offering to achieve vintage analog sounds and worn out tape delay sounds. Learn More. Looping – These pedals are miniature recorders that capture a passage, which you can then play back as much as you like. Many looper pedals also allow you to layer multiple recordings, and advanced models support extra features like built-in rhythms, mic and other instrument inputs, MIDI, USB and more. It’s worth noting that all the power of a looper pedal does come with a steep learning curve, so be sure that you’re experienced enough to handle one of these bad boys before you bring home one of your own. A wide range of features combined with ease of use make the DigiTech JamMan a perfect sampler for practicing, composing, and performing. Learn More. he original Ditto Looper rocked guitarists with a lust for looping like nothing else. Finally something that was simple, made for guitarists and sounded great. Learn More. Gain – In simple terms, gain is the amount of power your signal is packing. There are a lot of stompboxes that come with gain boosters, which makes it easy to give your volume an instant bump when it’s time for a solo. But be careful of the creep if you add too much gain through too many pedals, or you might end up giving your amp more than it can take, which will throw your distortion out of control. Volume Pedals – These are simple rocker pedals that control volume. Also called “expression pedals,” they work as stand-ins for the volume dial on the guitar, so you have a hands-free way to control sweeps and boosts. The Ernie Ball VP JR. saves floor space and is optimized for passive instruments. A micro taper switch gives you 2 distinct swell rates. Learn More. Compressors – The role of these pedals is to lift up quiet sounds and rein in loud sounds, compressing the dynamic range of your signal – that is, the difference between the quietest and loudest sounds. They work wonders for songs with a blend of quiet and loud parts, since they let you play hard without busting eardrums, and the soft sections won’t be drowned out by ringing ears. Compressors also have the nice side effect of increasing sustain, letting your notes sound out longer before dropping off. Keeley’s most popular pedal, the Keeley compressor has become an industry standard for stomp box compression. Learn More. Expanders – The opposite of compressors, these take the dynamic range and stretch it further. The uses for these pedals are a little more niche and can include, for example, dampening the squeak of fretting sounds so that they’re not heard in the final mix. Limiters – Another derivative of the compressor, the limiter gives you a compressor’s high-volume attenuation without the low-volume boosting. They’re good for bringing sudden attack under control, as well as protecting equipment (and ears) from accidentally strong signals. Noise Gates – Something like a reverse limiter, the noise gate is designed to cut out hums, hisses and other sounds below the level you specify with the threshold setting. These pedals work well at eliminating white noise introduced by long effects chains or the wiring in old buildings. Combines patented HUSH technology with a noise-gating process. Learn More. As similar as the two instruments are, bass guitars have enough differences from electric guitars that bassists should definitely look for effects designed specifically for their instrument. By doing that, you’re getting a pedal balanced for the low-frequency dynamics of the bass, and built to help it blend better with the other instruments in the band. Many bass effects have the same purposes as guitar effects described above, including chorus, reverb, delay, phaser and tremolo. The MXR M82 Bass Envelope Filter delivers classic, analog, envelope filter sounds in an easy-to-use and compact pedal designed specifically for bass. Learn More. Some of the most important bass effects, though, are compression and limiter pedals. That’s because the subsonic sound waves produces by a bass can actually damage your gear, so it’s always a good idea to have the right sound-conditioning effects attached to keep everything safe… especially if you’re trying to push the envelope. The more pedals you collect, the more you should consider investing in a pedal board as well. Some pedal boards are simply that – boards – to which you can stick your stompboxes to keep them organized. But you can also get powered pedal boards, which have built-in DC power supplies. That means no need for batteries or individual adapters connected to each pedal: just tether them to the central source, and you can power them all up by plugging the pedal board into a single outlet. Pedaltrain PT-2 Pedalboard with Softshell Gig Bag. The highly-protective panels incorporated into the top and bottom will keep your valuable pedals safe. Learn More. Pedal boards are considered virtually a necessity once you get enough experience to start playing in a group. Whenever you need to travel to a gig or practice, your pedals will all be in place and ready to go – and many pedal boards even come with fitted gig bags or covers, making transportation a breeze. If you have an amplifier that supports an effects loop between the preamp and power amp section, it’s worthwhile to really sit down and take the time to experiment in-depth with how each effect can work uniquely in that position. Within this loop, the same general order is going to work best in most cases. There’s a lot of knowledge here to digest, so the best advice anyone can give you is not to sweat it too much. You aren’t going to become a pedal encyclopedia overnight, and even if you could, you’d be missing out on the fun experience of trial and error that comes with figuring out your first pedals. The truth is that some of the most distinctive guitar and bass effects ever recorded have been the result of artists experimenting with effects units they’d never used before – especially in the 1960s, when pedals were brand-new to everyone. The moral of the story is to keep your eyes open to the possibilities, take each pedal one at a time, and learn just how far you can take your sound once you’ve added a few of these powerful tools to your performance toolbox.